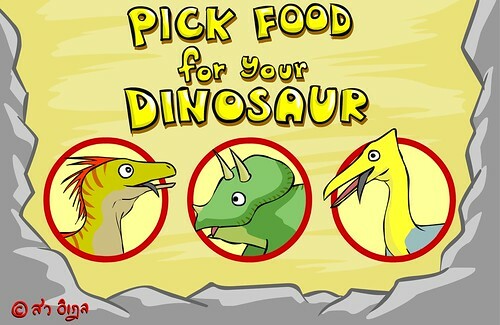 Pick Food for Your Dinosaur is a game that user needs to choose one of the avatars which are Utahraptor, Triceratop and Quetzalcoatlus. The next step is to click the right food for the avatar. 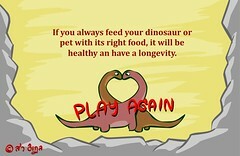 As this game has 3 different dinosaurs, this game also has 3 different foods. These 3 different foods will fly around, and the user has to be fast to click on it. 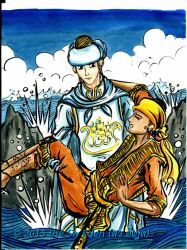 The difficult thing is the image of the right answer will always fly behind the image of wrong answer, and also the image of right answer will fly faster than the image of wrong answer. 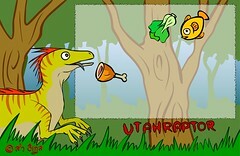 From the knowledge in the section Famous Dinosaur, we knows that Utahraptor is the meat eater, so the right answer will be the image of meat. 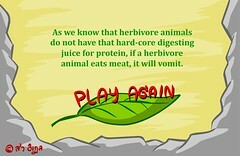 Fish is also counted as meat, so if you click meat or fish, your answer is right. 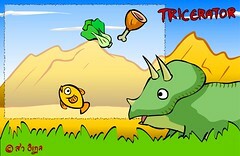 From the knowledge in the section Famous Dinosaur, we knows that Triceratop is the plant eater, so the right answer will be the image of vegetable. 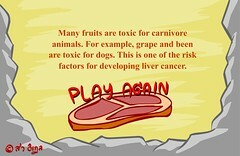 This means to get the right answer, the only image that you can click is the vegetable. 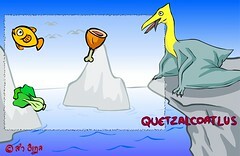 From the knowledge in the section Famous Dinosaur, we knows that Quetzalcoatlus and other flying reptiles are the fish eater, so the right answer will be the image of fish. Fish is also counted as meat, so if you click meat or fish, your answer is right. Below the text of the result, this part also has a back button for the user to play it again.